The Spaghetti playful font includes main & alternative uppercase, and main & alternative lowercase, and the full set of double letters in upper and lowercase, and large range of numerals and punctuation. The Spaghetti font will be perfect for use in all your design projects be it logos, labels, packaging design, blog headlines. Also, it will look great on mugs, cards, kids books headlines or other typographic projects. 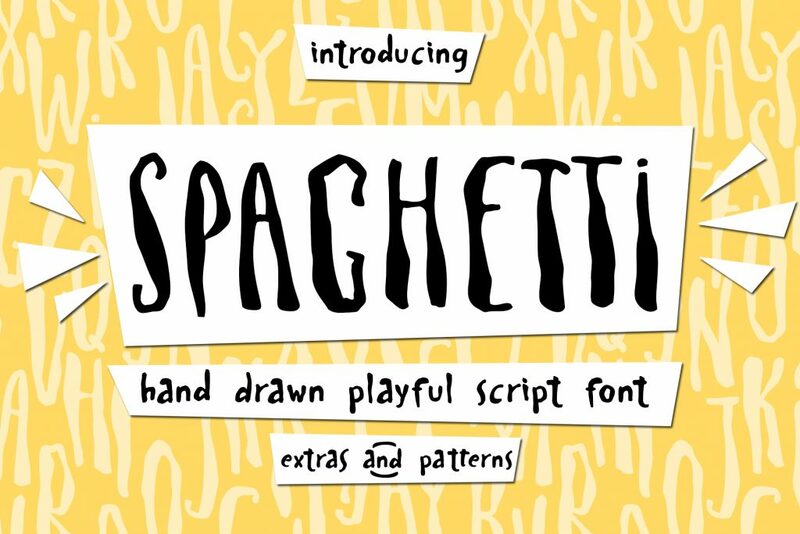 The Spaghetti Symbols is an additional font with 52 hand-drawn doodles, catchwords, arrows, and swashes and can help to make your design more original. Combine and arrange swashes and illustrations to create your own designs and make borders, frames, dividers, logos and more (just use A-Z and a-z keys in the included Spaghetti Symbols font). A different symbol is assigned to ever uppercase or lowercase standard character so you do not need graphics software just simply type the letter you need. As BONUS to Spaghetti font, I added 5 seamless patterns in .JPG .EPS .PNG and .ASL formats. A font family published by Ira Dvilyuk on Friday, October 19th, 2018 that has 890 views so far.